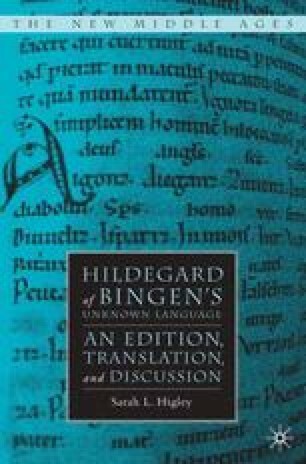 Hildegard of Bingen (1098–1179), twelfth-century anchoress, nun, and magistra from Germany’s Rhineland region, hardly needs an introduction to the popular and scholarly world, although her “Unknown Language” might. Born the tenth child to the nobleman Hildebert and his wife Mechtilde in Bermersheim, she was given when eight years old into the keeping of Jutta of Sponheim, her mentor, with whom she was enclosed five years later in the Benedictine monastery at Disibodenberg. 1 Dead to worldly life, she was to live the rest of her days as an anchoress, until at the age of forty-three a divine voice told her to write and say what she saw and heard in the visions she had kept secret until then. The extraordinary achievements of this woman who began her career in this way have captured the imagination of learned and laity alike: despite illness, legal and political obstacles, and the burden of being female in a medieval monastic world, she became the manager of the convent at Disibodenberg when her mentor Jutta died in 1136, the founder of two other convents (at the Rupertsberg near Bingen and across the river Rhine at Eibingen), a writer, teacher, preacher, advisor, composer of music, healer, visionary, prophet, letter-writer, and language inventor.